Ads have been an important part of the internet since its very beginning. Advertising is the main income for many web sites, and by accepting ads, we have been able to consume online content free of charge. In time, though, ads have turned out to be one of the major annoyances of web browsing, and today consumers are working hard to get rid of those annoyances. As more people talk about and install ad blockers, we think it’s time to share our thoughts on ad blockers. 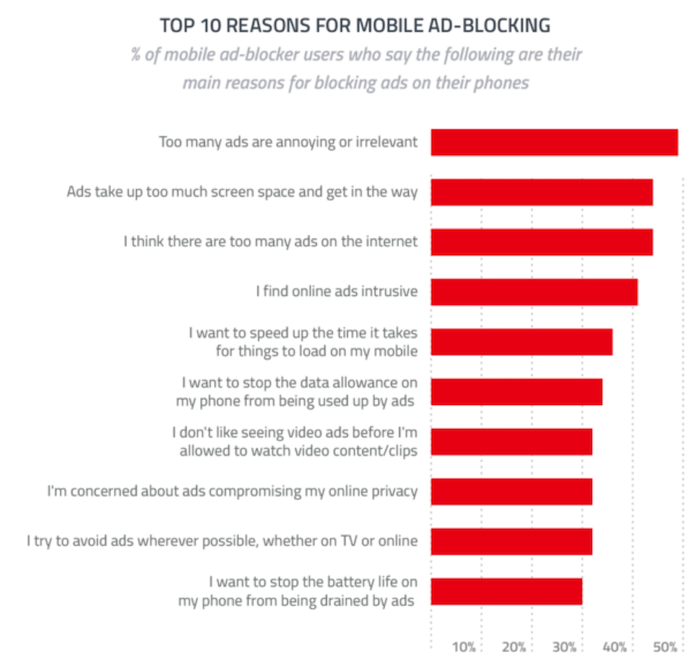 Here are the most important reasons why people are embracing ad blocking. Not everyone has super-fast broadband – many people access the web via mobile phones over slow cellular connections, via tablet devices on crowded hotel or cafe Wi-Fi, or on the go with a mobile dongle. Online ads gobble up more bandwidth than ever, causing webpages to load more slowly. 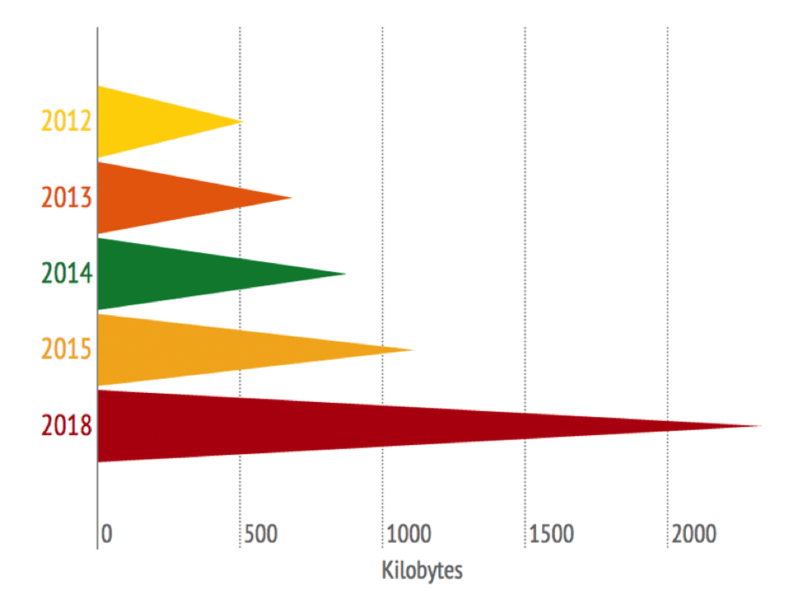 The average size of a webpage has doubled since 2012. Opera’s own test tool within Opera for computers proves that some webpages are slowed down by as much as 90% due to (bloated) ads. In other words, improved performance results in an improved user experience and more engagement on a website. In addition, there are other indicators of performance to consider, such as CPU usage or battery life. 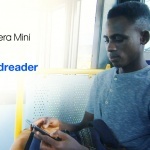 Many people who browse with Opera are in emerging or developing economies, where mobile bandwidth is more expensive than in the U.S. or Europe. 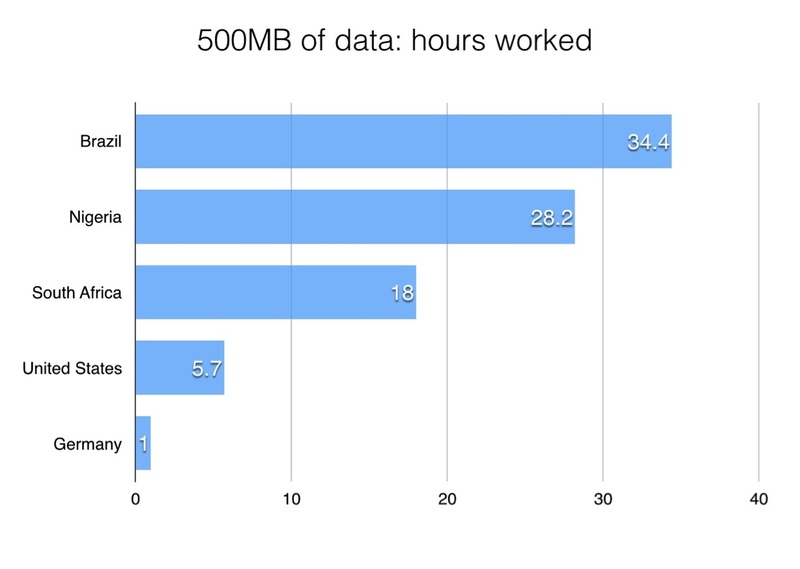 In Brazil, it takes 34 hours of work to afford 500MB of data. Privacy and tracking of online behavior is another concern. Most websites track their users in some way or another. Trackers are a central component for ad networks to profile users across websites and match an ad with a person’s interests, which in turn gives higher click-through rates and increased revenue for advertisers. However, by their nature, most trackers degrade user privacy. The number of trackers online has greatly increased over the last few years. But, not all trackers are made to identify you as a user; some trackers simply measure webpage traffic for third-party statistics. We’ve all been there. Ads often cover the content that you’re trying to see, or even trick you into clicking fake buttons, leading you to places on the web that you are not interested in. Ads that move around, look like articles, or in other ways disrupt the user experience are far too common. In fact, one of the most common ad formats, “takeover banners”, are designed to take over your web experience to maximize your attention to the ad content. But, let’s be fair. Ads have some benefits. Publishers need to make money to pay journalists, editors, bloggers, technology development, innovation, and all the other things that live within the publishing house. By enabling websites with a business model to earn money, ads are fueling the web. Much of the content billions of people experience online every day is paid for by ad revenue. The more quality content to choose from, the better – for everyone. From a publisher’s side, trackers make it possible to customize the user experience, to increase engagement and provide better content for each visitor; so, from their side, trackers are actually often positive. The point is: ads bring some benefits, which should not be forgotten. More and more people are using ad blockers. In a recent study conducted by PageFair/Adobe, the number of people using ad blockers grew by 41% worldwide between 2014 and 2015, with 98% of those users on computers. According to this research, more than 200 million people have installed ad-blocking tools. Ad blockers are mainstream and growing rapidly. 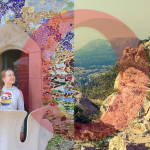 At Opera, we have always believed that browsers must serve the user. We’ve long allowed users to turn off images to save bandwidth, or reflow text after zooming. Opera Mini in Extreme Mode compresses pages very aggressively, often losing design details and therefore annoying web designers. We do this because the web is not perfect, and we have to provide people with solutions to overcome the online challenges they encounter. We actively intervene in the interests of the end user, who is the one paying for bandwidth. We don’t hate online advertising. We’re a business, and have a subsidiary organization called Opera Mediaworks, which does advertising. But, we’re also a consumer brand, and consumers are sending a loud, clear signal to brands and advertisers that the current situation must change. Years ago, pop-up ads plagued the web. All browsers then introduced pop-up blockers. The ad industry didn’t die; it adapted. We want the ad industry to adapt again, and be better web citizens. It’s time for us to take a stand: We are taking the user’s side in the debate about ad blockers, which is why we will offer built-in, native ad blockers to our hundreds of millions of users. 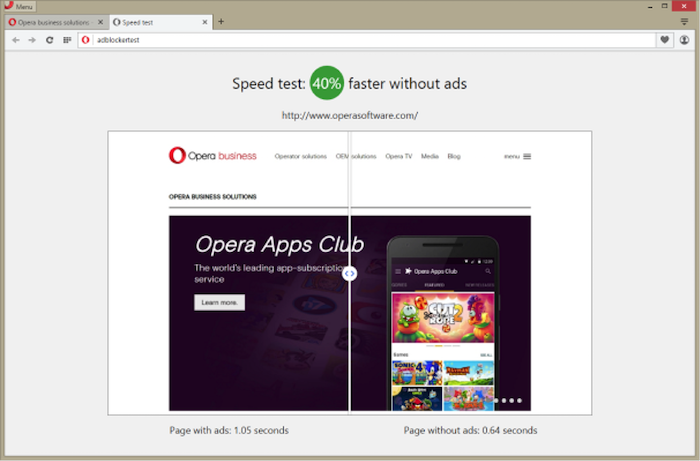 In Opera for computers, we also provide a tool to help advertisers and users understand the problem of heavy ads. With this tool, users can test, for themselves, how heavy a webpage’s advertisements are. Then, they can make an informed choice about whether or not they want to block ads or add a page to their own whitelist. Since announcing a native ad blocker in the desktop browser’s pre-release Developer build channel in March, we’ve been avidly reading feedback from consumers and people who work in the advertising industry or those whose websites are monetized from ads. Consumer feedback has been overwhelmingly positive. Who doesn’t want their webpages faster? We think browser-level or server-side native ad blocking is faster and better than extensions or other third-party tools. Opera currently only features a very small whitelist of websites, but we’re aware we need to provide a better solution for the future. The big question is: which ads are good, which are bad for the users, and who is responsible for making it better? Apparently the answer is “Not me”, from everyone in the ad-value chain, according to this post on Medium. We first considered implementing our own solution, but after discussing with industry bodies like Internet Advertising Bureau (IAB), we think we can influence the ad industry to change by working together with them on their existing standardization efforts. Opera is now talking with IAB to see how a browser can implement support for their LEAN initiative, once this is ready, if it truly manages to serve the end user needs for speed. The consumer is sovereign, and, as IAB says the ad industry has messed up. 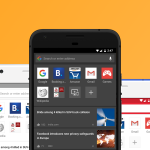 Opera has always been about faster browsing, because that is what our consumers want. We hope that the ad industry will work harder and take responsibility to find ways to engage the user, without disrupting users’ browsing with intrusive, slow ads. We all deserve a better, faster web. It’s time to take a stand on ad blockers.